Battery recycling is a recycling activity aimed at reducing the number of batteries being disposed as municipal solid waste. Batteries contain a number of heavy metals and toxic chemicals; their dumping has raised concern over risks of soil contamination and water pollution. The main objective for recycling batteries is to prevent hazardous materials from entering landfills. Lead acid and nickel-cadmium batteries are of special concern, and although Li-ion is less harmful, the aim is to include all batteries in the recycling programs. Do not store old lead acid batteries in households where children play. Simply touching the lead poles can be harmful. Collection: Retail stores, small and large businesses, cities, towns and government agencies collect batteries (up to 5 kg) and cellphones at their locations. 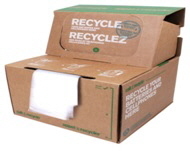 Collected items are then shipped to Call2Recycle partners, such as Retriev Technologies, Newalta and Laurentide Re-Sources. Sorting: Retriev Technologies, Newalta and Laurentide Re-Sources receive the batteries at their warehouses, record details about the weight and battery types of the shipment; then separate the batteries by chemistry. Cellphones are sent to the Wireless Alliance for recycling. recycling process are exported out of the country.